A big thank you to all of those who attended our Open Day on Saturday making it the great success it turned out to be. Once again the sun shone on us throughout the day and the temperature rose a few degrees over what it has been for the last few weeks. Those few degrees made all the difference when standing outside admiring all of those wonderful cars. It really did feel like early spring, once the morning chill had been blown away. With some visitors having a round trip of over 300 miles to be with us, an early start was required and I know it wasn’t quite so warm then. It would not surprise me if so many flying jackets and helmets had been in one place since the battle of Britain! But it did warm up and turned out to be a very pleasant day. Sue’s tea and coffee also did the job of getting those early arrivals warmed back up again. We really did have a great mix of TR’s arrive and all appeared to be in great condition. 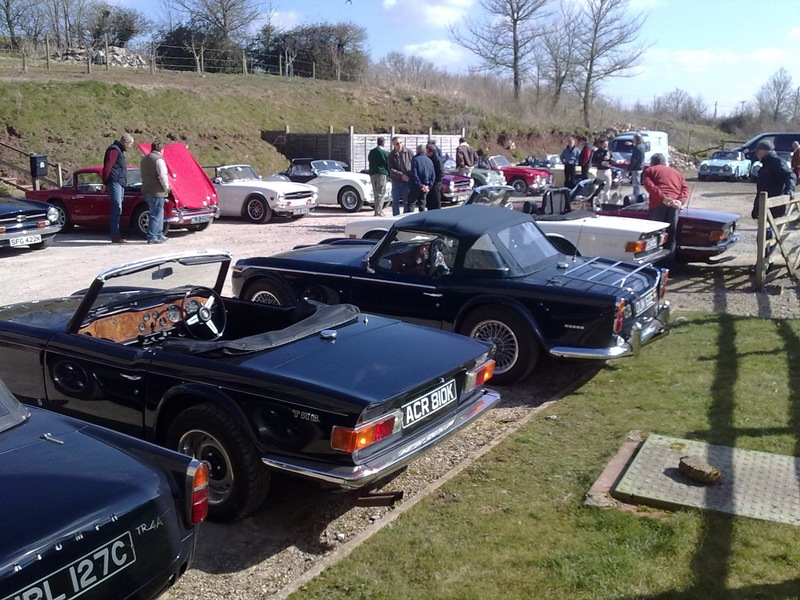 Our car park was more of a display stand, with all of the cars on show rather than the normal mix on the car park. Cars were parked on both sites, so you really did need to walk around to see them all. 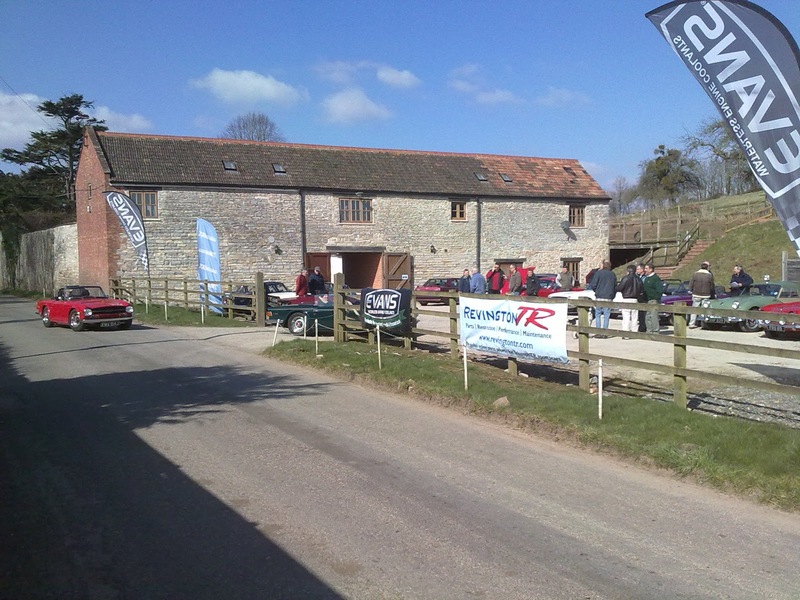 With so many cars and TR enthusiasts our visitors were able to swop notes and learn from each others experiences. 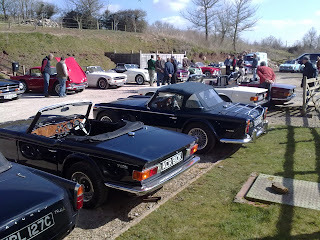 We had a great looking Triumph Roadster arrive, Ian Pauls rally TR and once again many more TR5’s than you would expect. We also had a “Hot Rod”/”Funny Car” with a very strong Americana feel to it. Most people did notice the “Tommy Gun” in its rack in the passenger footwell, obviously not a guy to mess with. Our guest presenters made themselves available for questions on their specialist subject throughout the day. Graham Robson teamed up with Neil for some banter and informative background on TR’s. Superpro Europe Polyurethane bush specialists also had a great display and had a steady stream of interested parties throughout the day. Nathan from Evans waterless Coolants also spread the word regarding their great product and also had several discussions with potential customers . The tea, coffee, biscuits and cakes are finished and now it’s time to start planning for next year. I hope you are able to make it then and join in what is always a great day for us and visitors alike. See you in 2014.